An SEO audit will tell you what’s working on your current website, what’s falling short and how you can improve your site to rank higher and generate more leads. In 2017, online traffic is the lifeblood of any business. If you don’t get enough high quality, targeted traffic to your website, it will be almost impossible to make decent profits in your business. It doesn’t matter how great the end product is, or how beautifully designed your website is, you won’t make big profits if you don’t get enough quality clients. There are so many ways to get traffic to your business. The problem is that most methods are just too difficult, too expensive or do not provide the right traffic. So, what is the most effective way to drive potential clients to your site and to make bigger profits? Getting ranked well on Google and other search engines is THE best way to get long-term traffic for YOUR business. The visitors that search for a specific keyword or phrase are the BEST visitors you can get because when they find your website, you KNOW that it’s exactly what they are looking for. In June of 2013, Chakita.com, a well-known ad marketing agency, released a study on the value of Google search result positioning. It should come as no surprise that there is a significant drop in traffic from Page 1 to Page 2 results, with traffic dropping off by 95% for Page 2. This means that your conversions % from leads to paying clients will go through the roof! If you’ve avoided or disregarded SEO, it’s time to reconsider. According to a June 2015 study on American consumerism by Mintel, the world’s leading market intelligence agency. 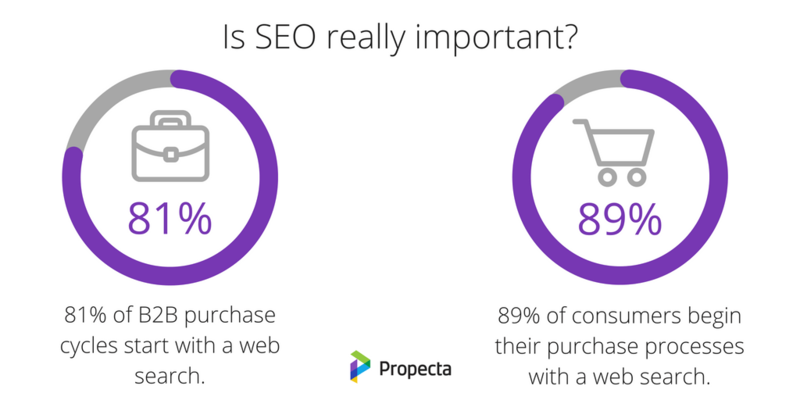 SEO increases your product reach, which will lead to increased leads and conversions. If your product information appears high in search results for related queries, it allows you to get your messaging in front of an audience of information-seekers and decision-makers that have expressed a direct need for your product by making a related search query. SEO makes you more competitive. If your product is recommended to a prospect offline, it strengthens your brand and authority when an online search results in the same recommendation via high search ranking of your product pages. However, if an online search result in prospects finding competitor product pages in the top results, you’ll have to compete more fiercely for the sale. SEO attracts quality leads. Visitors from organic search have expressed an intent to purchase by performing a search for the queries you’re ranking for. This means leads that are the outcome of effective SEO may be more likely to convert than those coming from other sources. If I we were to google the service you provide in the area you service, where would your business show up in the search results? Local SEO reaches local customers when they’re looking to buy your service – they need your service and they’re ready to buy it. As Google now focuses greatly on location, ensuring that your website is optimized for local searches is crucial. This will allow prospective clients to easily identify your business, find the location, directions, opening times and more. Ready to fix your SEO? We’re here to help. Implementing SEO best practices can significantly help your website outperform competitors while building your brand reputation and exposure in local search results. Before you can start fixing your SEO, you have to know where to start. That is why for the next 48 hours I am offering you a $49 SEO audit. Normally we charge $299 for this, but because you are a friend of Digital Tradesman and took the quiz, I want to give you a $250 gift. A full SEO audit of your website. I will perform a complete analysis of your local search efforts. And I mean I do the analysis – not some cheapo “free scan” tool. You’re getting my trained eyes – as someone who knows what to look for. You get a step-by-step roadmap that helps you attract more of your ideal clients. The search engines are constantly updating their algorithms. Google updated their Google Webmaster Guidelines. Make sure you are compliant. SEO last year is different than it is this year. The rules have changed. What was acceptable last year is not acceptable this year. You may have content on your site that it outdated. Find content that people aren’t visiting anymore. The search engines, as well as your own site visitors, like fresh content. Make sure your content is fresh. View the errors on your website during an SEO audit. Fix those errors and recover lost traffic to your site. Find who is linking to you and find the good, bad, and toxic links to your site. View the links to your site and clean up your link profile, which will help search engine rankings. If you think your site is underperforming or you’re simply not sure, then a site audit may be right for you. If nothing else, you’ll receive a ton of useful and actionable information and you even may be able to increase organic search traffic, keyword rankings, site conversion and ultimately improve sales. You can see that this is a great solution to get a better understanding of your current SEO efforts. Yep, just $49. Get instant access right now. Simply CLICK ON “Buy Now” Below and we will begin your SEO Audit. Typical turnaround time is 1-3 business days. Yes! I want to get my hands on this awesome SEO Audit so that I can catapult my site to the front page of Google and skyrocket my profits. Cheaper than a bag of nails! P.S. Remember – By offering a full 30 days money back guarantee, I take all the risk. You can take this offer risk-free TODAY and boost your profits easily. Let’s Get Started!